Baking Dil: Stu & Grandpa prepare a surprise birthday party for Didi. They have everything prepared except for one crucial element -- the birthday cake, which they forgot to get while rushing to get the party together. 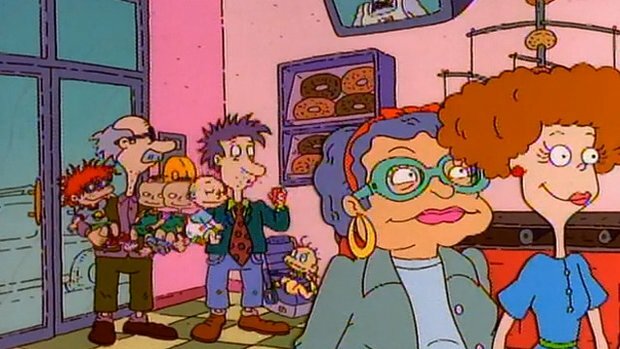 They take the Rugrats to Bob's Fully Automated Bakery to get the cake. While there, Tommy's gift to Didi, a frog, gets away, prompting Dil to try and find it while the Rugrats try to rescue Dil before he becomes a cake. Meanwhile, Betty takes Didi to an English tea shop, where waiters sing songs for every occasion -- to the tune of "Hail Britannia". Hair! : Grandpa's old army buddy, Roy Davis, is paying a visit, but Grandpa's afraid that he'll be embarrassed by his baldness and being out of shape. Meanwhile, afraid that Tommy will stay a baby forever because he's bald, according to Angelica (of course), the Rugrats try to find hair for Tommy.